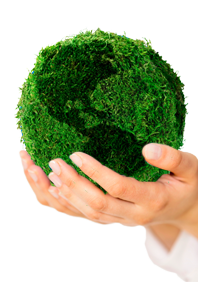 Traditionally, hospitals and other generators of infectious waste simply burned medical waste in fossil fuel-fired incinerators or deposited them into the municipal solid waste landfill sites. This practice caused several environmental, health and safety problems evoking public outcry and opposition. One of the major negative consequences of incineration was the chemical emissions and particulate matter generated and released into the atmosphere. Nearly 50% or more of the medical waste stream is comprised of Polyvinyl Chloride (PVC) plastic, which has proven to be non-recyclable and a major source of dioxin, Nitrous Oxides (NOx), Carbon Monoxide (CO), Carbon Dioxide (CO2), and heavy metals (all internationally regulated air emissions) when incinerated. As air quality standards have become more stringent, previously unregulated medical waste incinerators are being shut down due to the high cost of maintenance, the growing concerns of increasing levels of CO2, NOx and CO from emissions, and the prohibitive cost of retrofitting incinerators to meet pollution standards. This incinerator-related "backlash" has already occurred in the United States, causing a large number of incinerators to be decommissioned and shut down. 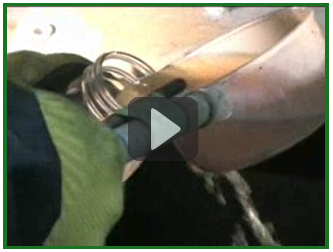 Remediation Earth Inc.'s technology is designed to process "Red bag" and sharps waste. 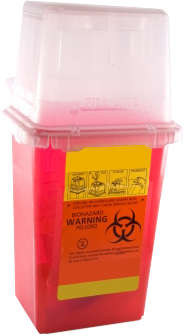 A large portion of all medical/hospital waste is comprised of red bag waste and sharps. Red bag waste includes contaminated bandages, dressings, cotton, gauze, paper, gowns, bedding, latex gloves, masks, suction canisters and sponges. Sharps includes contaminated needles, syringes, syringes containing fluids, scalpels, glass test tubes, pipettes and petri dishes. 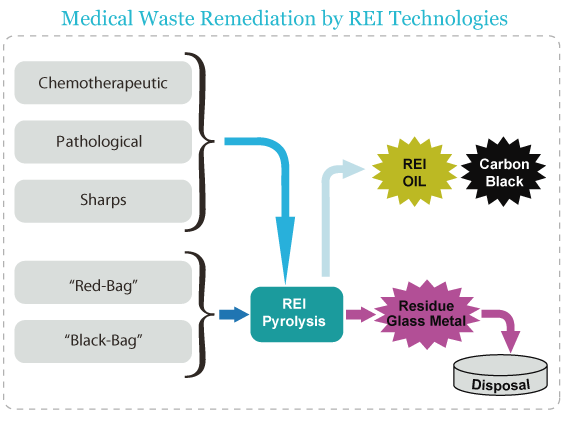 The Figure below provides a description of how a medical waste system employing REI technologies might operate.